Mr Richardson names three particular factors putting downward pressure on prices. The Deloitte report reflects recent data from Thomson Reuters, which shows changes in the rate of residential property price growth, year-on-year. A falling line in this chart doesn’t necessarily mean prices are dropping — simply the rate of growth is slowing — but if it drops below zero then prices are technically falling. 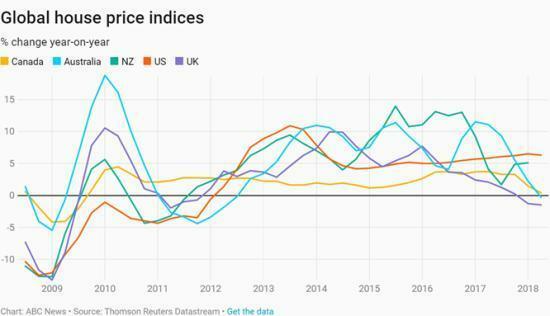 The above chart shows that the UK — which had an epic housing boom along with, not coincidentally, one of the world’s most extreme consumer credit bubbles — now has falling home prices. Australia just tipped into negative territory with Canada right on the cusp. In each country, a reverse wealth effect is kicking in. Homeowners are seeing their home equity – aka their net worth – stop growing and in some cases drop by shocking amounts. In Australia it’s $1,000 a week, which is enough to darken the mood of pretty much anyone not in the 1%. A consumer with a dark mood is an unenthusiastic shopper because new debt accelerates the decline in net worth.